2. Color on the Lower Lash Line: I think this is my favorite way to add color to my makeup. It looks very pretty and wearable. The purple shadow is MUFE #92. 3. Pop of Color on the Inner Corner: I’ve worn this a lot during the daytime. It’s the subtlest way to add any color to your look. The orange eye shadow is MAC’s Rule. 4. Colored Smoky Eye: Instead of using mostly neutrals or black shades, a colored smoky eye is an easy way to incorporate color. It keeps the look dramatic but not overly dark. This was a nighttime look as well. 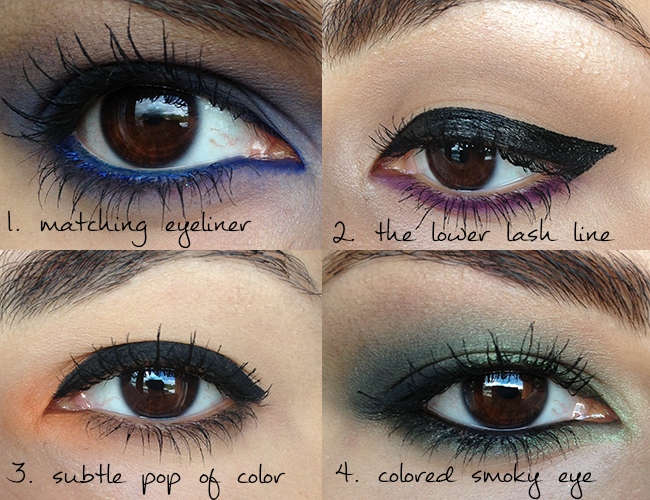 What’s your favorite way to wear colorful eye shadow? Past Try It Out Thursdays: MAC Mixing Medium, Ombre Lips, and Red Eyeliner. This is wonderful!! You did an amazing job 🙂 I love the lower lashline idea! Ooo love all the pops of color! Gorgeous! I love all of these looks! I only do colourful smokey eyes. I'm so afraid of colour eyeshadow because I never know what blush and lipstick to pair with them. I love the third option. I'll have to try it out. Love the green shade you use for the smokey eye, it really makes your eyes stand out a lot. The green smokey eyeshadow looks phenom with your brown eyes girl! I love wearing colorful colors!